UNP yesterday questioned former President Mahinda Rajapaksa’s motives to visit India and his comments made to Indian media. 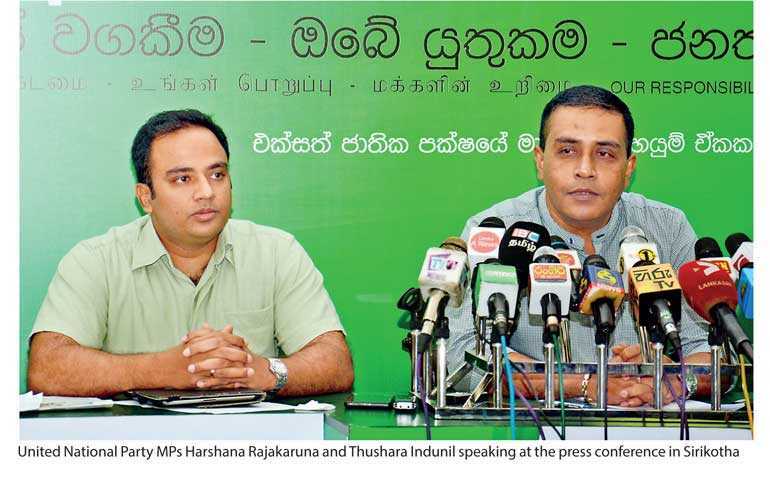 Parliamentarians Harshana Rajakaruna and Thushara Indunil criticised Rajapaksa’s foreign relations policy for being the reason for scrutiny the country is currently going through. “The Opposition was all against Good Governance and Modi relations. India voted against us, the EU cancelled out our GSP plus, and the US put restrictions on us,” MP Harshana Rajakaruna said at the press conference. MP Harshana Rajakaruna questioned the line of succession in Sri Lanka Podujana Peramuna and the Party’s stance on the next Presidential candidate. Taking excerpts from Mahinda Rajapaksa’s interview by the Hindu paper, Rajakaruna probed about the answers given by Rajapaksa on the next Presidential candidate. “Mahinda Rajapaksa introduced Namal to Modhi, not anyone else. And when questioned by the Hindu newspaper on who the next Presidential candidate would be, his answer about Namal not being eligible by age and the vague answer about a brother of his being suitable needs speculation. This seems like a farce to just stretch time until Namal Rajapaksha is eligible to become a Presidential candidate. Whatever the case, it will be the same group that was defeated last time that would come back to compete in the next Presidential election,” he said. Disapproving Rajapaksa’s response regarding the Mattala Airport, Parliamentarian Thushara Indunil criticised the motives behind Mahinda Rajapaksa and Modi meeting. “When questioned about Rajapaksa’s stance on the lease agreement of Mattala Airport to India, the former President replied saying that the reason for his visit is not to discuss that issue but to voice his disagreement towards the privatisation process happening under Maithripala in the Good Governance,” Parliamentarian Thushara Indunil said.